The latest Steering Committee meeting of the group working to implement the Plan of Action marking 20 years of the Guiding Principles on Internal Displacement (GP20) gave the floor to Nigeria, Ethiopia, Honduras and Ukraine. They showcased their diverse approaches to collecting, analysing and using data on internal displacement for emergency response, law and policy development, and implementation of national housing restitution programmes respectively. Check out the detailed write-up for more on the country presentations. 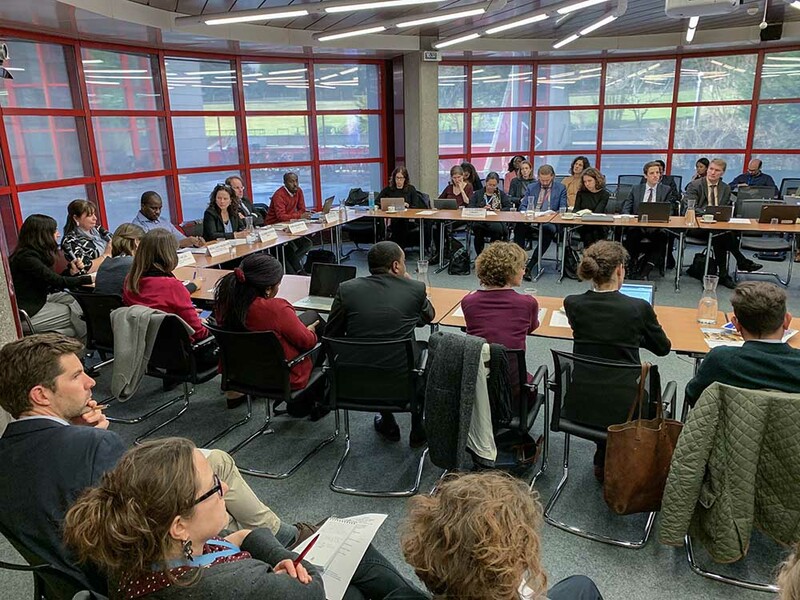 Participants gathered at the latest meeting of the Steering Committee of the GP20, March 2019. Data collected on internally displaced persons is often tailored to immediate priorities such as informing humanitarian responses following a natural or human-made disaster. Displacement situations are often assumed to be of short-term duration (despite a growing number of protracted contexts) and data systems are shaped accordingly, as Abdullahi Abubakar from Nigeria’s National Emergency Management Agency (NEMA) explained as he presented their work with IOM’s Displacement Tracking Matrix. In this way they are suitable for capturing essential data on humanitarian needs related to food, shelter, health, WASH, education, etc. and help build partnerships with actors able to respond to these needs. Such data systems are not without challenges, as Dawit Abraham from Ethiopia’s National Disaster Risk Management Commission (NDRMC) described, however the value of the essential data they produce is widely recognised. Shaped in this way, however, the data produced results in evidence that is often not fit-for-purpose in protracted crisis contexts to adequately provide for longer-term information needs, e.g. for development planning as well as solutions policies and programming. Similarly, the data systems – designed to collect data with speed and agility – don’t incorporate appropriate methods and coordination mechanisms to allow for transition into systems that can support comprehensive solutions analysis. It is important to accept that there is a displacement problem in order to be able to address it. This, however, leads to a classical “chicken-egg” dilemma with regards to data requirements: data is needed to help or encourage recognition of the issue, but at the same time a full acknowledgement of the problem is necessary to allocate appropriate resources and define information needs laying the foundation for data collection, analysis and use. The point was raised by Myrna Mejía from Honduras’ Property Institute, referring to the pivotal role of the 2014-2015 Government-led profiling exercise and the commitment, under the MIRPS, to develop and maintain the register of abandoned property due to forced displacement. From our experience at JIPS, it is thus an iterative process as a displacement situation continues: we need the bigger picture to inform the work moving forward. Nevertheless, this demonstrates well the power of good data that can inform the initial understanding of a displacement situation as well as help design and facilitate access of IDPs to solutions. Moreover, it brings to light the unparalleled value of the involvement and leadership of national authorities in displacement data systems. As Myrna Mejía mentioned, “capacity building support received from the international community and civil society has been instrumental” in developing a registry of properties abandoned by IDPs and implementing a system of protection in Honduras. This demonstrates that investment in strengthening existing institutional structures, which build the foundation for solid national data systems on displacement, can have a positive long-term impact in support of better protection and solutions for IDPs. It is critical that these structures are responsibly strengthened. “There has been a perceptible shift from gathering data on IDPs to gathering data on IDP situations”, as Cecilia Jimenez-Damary, Special Rapporteur on the human rights of IDPs observes in her opening remarks. As a matter of fact, displacement happens in a wider context impacting not only the persons being displaced but also the communities and places hosting them. Nevertheless, the different datasets – of the needs of IDPs on the one hand, and of the capacities of communities and places receiving them on the other – are currently rarely effectively brought together which has become a regular hindrance for incorporating IDPs into local and national development planning processes. Fostering collaboration between government institutions as well as with relevant humanitarian and development stakeholders to better link IDP data to national statistical systems, can help bridge this gap. This is well illustrated by the presentation from Vadym Pishcheiko from Ukraine’s State Statistics Service (SSSU), where efforts are underway with support from Statistics Norway to enhance such coordination and through this process to strengthen the quality of the data systems in place. The group working to implement the GP20 Plan of Action is also looking at three other key areas, which besides internal displacement data includes protracted displacement and durable solutions, IDP participation, as well as laws and policies on internal displacement. Building on its March meeting, the next Steering Group meeting, planned for June 2019, will look into what data is needed to address protracted displacement and secure durable solutions, taking into account the impact it has on related sectors of society. Have you worked on developing data tools or indicators tailored for long-term solutions for IDPs? We would really like to hear about your work: get in touch at info@jips.org or find us on Facebook, Twitter, or LinkedIn.